The Art of the Treasure Hunt” is a journey through Chianti in search of its hidden gems. A result of collaboration between passionate art and wine lovers, the second edition of the project brings together a wide range of artworks, from photography, through sculpture to film and site-specific interventions. International artists feature their works in the finest wineries of the region, in response to the unique character of historical venues. The treasure hunt is an experience oscillating between the old and the new – its participants contemplate contemporary art in the shadow of ancient cellars while savouring new oil and tasting aging wine. Fèlsina installation: HARD PRESSED WIRE – Advertising board, pressed can, and wooden beam. Focusing on the objects and space that mediate human relationships, Gabriel Kuri explores the potential for transformation latent in all familiar things and situations when observed from an unconventional angle. Playing with the principles of minimalism and the history of consumption, he integrates elements of everyday life into sculptures and collages. In his work, the viewer’s attention is drawn to the dynamic and unstable space that opens up at the intersection of two opposite concepts, in the precarious and yet precise meeting of the unexpected. Often accompanied by idioms and vernacular phrases, his pieces invite a multilayered dialogue between the verbal and the visual. Kuri’s work questions the given tenets of contemporary culture, creating poetic juxtapositions and hybrid objects that serve to rethink the mundane, to find the eloquent and the extraordinary in daily life. Michele Spanghero’s research is focused on the relation of sound and space. In the sound sculpture dià (from greek διά, through) he combines the dimensions of silence and sound. 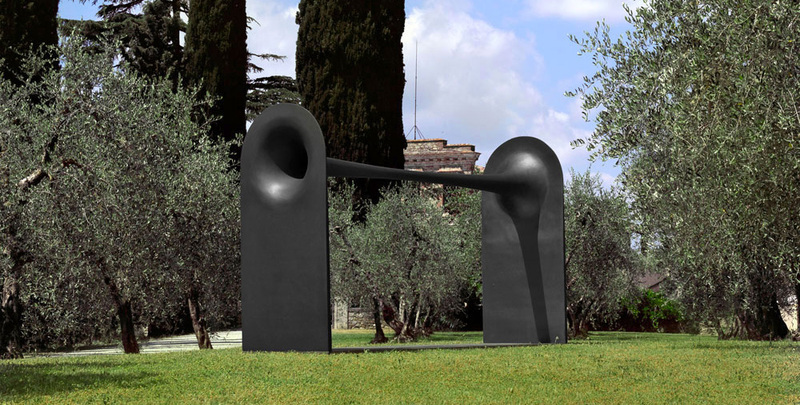 The sculpture is shaped as a golden ratio double horn, through which the spectators may listen to or observe the surrounding landscape. It is a device that invites the audience to interact with the two cavities as a megaphone or a peephole, to start an intimate dialogue through the sculpture itself.